Founded around 170 BC on the site of an older prehistoric age settlement about 50km north of Amman, Jerash (ancient name: Gerasa) is one of the best preserved and most easily accessible Roman sites in the eastern Mediterranean. With the Roman conquest in 63 BC Jerash was incorporated into the Roman province of Syria. In the following century Jerash experienced a period of substantial growth and stability. 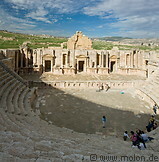 After the fall of the Roman empire Jerash entered a period of slow decline. The current site is quite large, measuring about 2km from north to south. It consists of a number of more or less well preserved ruins. West of the archaeological site lies the modern city of Jerash.